Seaweed, lighthouses, housefloats, one very intrepid sailor, and news from around the state. Two Maine-based artists have built a shanty-style housefloat and plan to motor it down the Mississippi, creating art as they go. Are you looking for the perfect little lake yacht? Might we suggest a Bluejay, Lightning, or Laser? Hang around just about any Maine boat ramp and the odds are good that a Corson runabout will show up sooner or later. Like lobsters and blueberries, they are a boat with as much “Maine-ness” as maple syrup and whoopie pies. Brook trout measured in pounds rather than inches are not uncommon in the Rangeley Lakes Region of western Maine, but there is one fish that stands out above all the rest. He is called White Nose Pete, although some refer to this piscatorial desperado as Pin Cushion Pete. You’d think someone whose ancestor built canoes would own beautiful examples. Benson Gray explains why that’s not so, and how he finally did find an heirloom boat. Water is a vital element for painter Marguerite Robichaux, a seasoned fly fisher who often combines painting and fishing trips, who captures the rivers and lakes of Maine. What’s the meaning of icing on the cake? In Deborah Corey’s case, it started with a recipe and led to a family tradition. Spring is on the way, and then summer. Rob McCall discusses lupines, opening up the “camp,” and other harbingers of warm weather. Two early summer camps in Maine. Images of summer in Maine, on the water and at camp, by Heather Perry. SLIDE SHOW: View more images by Heather Perry, this issue’s photographer in The Maine I Love. VIDEO: Boston’s Rich Wilson became the fastest American to sail solo around the world in the grueling Vendee Globe. Watch some videos from the race. EAT: Bagaduce Lunch in Sedgwick has a well-earned reputation for its fabulous lobster and crab rolls. Read more about the lunch counter in our 2007 essay. TRAVEL: Want to see more of Nahmakanta and life at a classic Maine Camp? Check out the video made by our friends at Off Center Harbor. WAX POETIC: White Nose Pete, the legendary trout that always got away, was immortalized in this poem, The Ode to White Nose Pete. VIDEO: Watching a Corson in a video is not as fun as riding in one, but sometimes you have to be happy with what you can get! Come along for a ride. MILESTONE: Happy 40th Anniversary to Hamilton Marine. Watch company founder Wayne Hamilton explain his philosophy in a video. 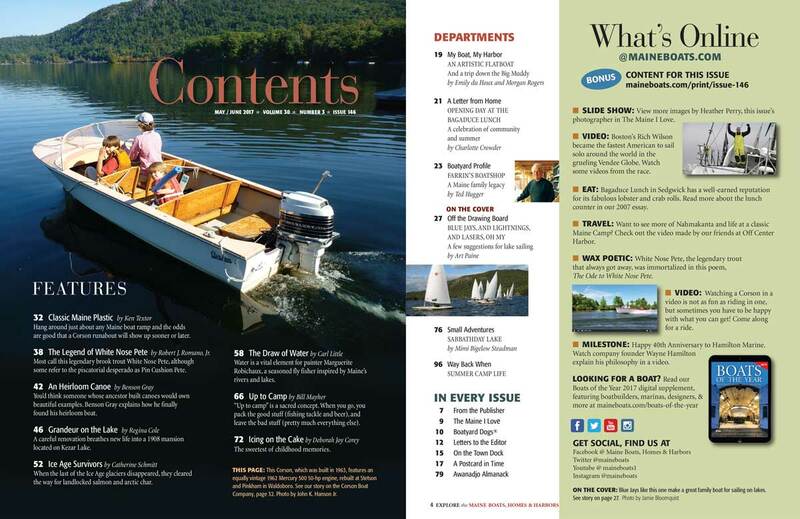 On the cover: Blue Jays like this one make a great family boat for sailing on lakes. See story on Page 27. Photo by Jamie Bloomquist.